Turkey’s democracy has had many pitfalls since the early days of the modern republic. The ruling elite, initially from the military and recently from the conservative Justice and Development Party (AKP), have tweaked the rules of the game to exclude others and preserve their stay in power. Since 2002, Turkey’s powerful AKP politicians benefited from the rule that required political parties to win at least 10% of the votes to send representative to the parliament. 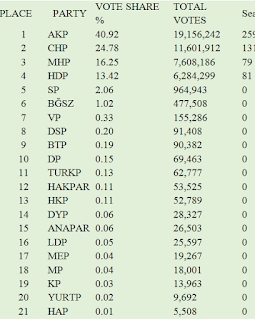 Kurdish politicians, especially, were marginalized forcing them to compete for elections only as independents, increasing the chances of the more powerful parties, in this case the AKP, to artificially inflate their share of seats. 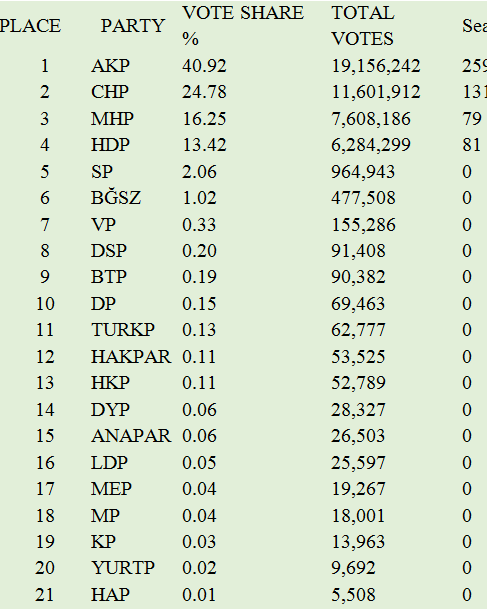 If the 10% rule were not in place, and more political parties were represented this time around, AKP would have an easier time finding a coalition partner that had won just 17 seats--not 80. For the first time, the pro-Kurdish party known as Peoples’ Democracy Party (HDP) has surpassed the 10% threshold and will be sending about 81 highly disciplined members to the parliament. This victory is not only good for the Kurdish people, it is also good for Turkish democracy. 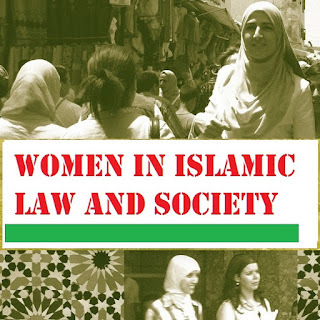 It deprived the increasingly authoritarian President Recep Tayyip Erdoğan from a chance to amend the constitution and give himself more powers. It solidified political pluralism. And it added a voice to minority voices in a political landscape dominated by a single party for nearly two decades. Now that the chances of changing the political system into a presidential system are significantly reduced, Turkish politicians should amend the constitution to strengthen their democracy, limit the power of demagogues, and usher in an era of cooperation. For this to happen, the terms of forming a coalition government, be it with the AKP or without AKP, must include their agreement to significantly reduce the 10% threshold. In reducing this absurdly high bar, more political parties will be able to take part in the democratic process and it will be easier for political parties to form coalition governments and work together instead of calling for new costly elections that rarely change the circumstances. Should this happen, Turkey will be able to escape the cult-of-personality politics that dominated public life in that country for so long. Then, Turkey can play a constructive role in a region deeply in need of stability, institutional governance, and peaceful transfer of power. AKP now has 259 seats, 276 seats are needed to form a government; 367 seats are needed to change the constitution directly; 330 seats to call a referendum to change the system.